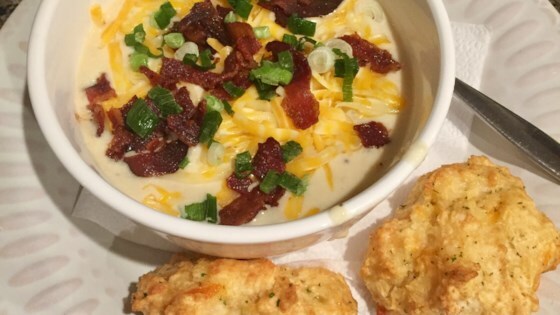 "This potato soup has more flavor than any potato soup I have ever had. It is a bit salty due to the bouillon cubes but you can add more milk to dilute if you find it necessary. For less creamy and lower fat, use whole milk instead of half-and-half -- still tastes great!" In a large pot, bring potatoes, celery and onion to a boil in 2 cups of broth. Cook until potatoes are tender, 15 minutes. Drain and reserve liquid. Combine reserved broth and half-and-half in pot. In a bowl, combine melted butter and flour. Stir into half-and-half mixture over medium heat. Stir until thickened. Stir in reserved vegetables, remaining broth, bouillon and pepper. Heat through and serve. See how to make a hearty potato soup with bacon and a touch of fresh cream. Maybe I did something wrong, but I thought this was bland and boring. Also, the half & half made it too rich and kind of sickening. Gonna throw it out. Sorry, I really wanted to love it. Great recipe. Great additions we used were, 1lb.bacon and more potatoes. This recipe is great. It tastes like the real, homemade potato soup my Mother used to make. Simple, easy, delicious!